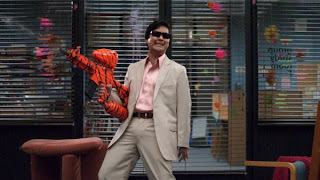 Episode Review: COMMUNITY, "Modern Warfare"
Tonight's Community was pretty much everything I expected and then some. I knew it was going to be a non-stop ride with every action movie cliche thrown in for good measure, but I was a little afraid that it was going to rely too much on references. "Modern Warfare" was packed to the brim with action flick homages, but they all worked, and the references weren't distracting (unlike every episode of Family Guy). The only minor gripe I had was the episode wasn't long enough. There was so much action and one-liners flying around that the show didn't have time to incorporate all of the characters fully. Plus, there wasn't very much plot, which makes sense since it was a spoof on action films. I just like a little bit of substance with my choreographed action sequences. Oh, and I wasn't a big fan of all of the Glee hate because they just made the show seems snarkier than it already is. We get it Jeff; you're cool so stop rubbing it in everyone's face. I was also a little surprised that they had Jeff and Britta go there because a.) it's season 1 and 2.) the context of their hook-up was so random. I guess it was kind of inspired that they had the two finally get together during such a crazy episode because their deed wasn't the main focal point, and the audience won't take it as seriously as all of the other "will they/won't they" couples that have graced our screens. I'm interested to see where the go from here, but their liaison was nothing more than an afterthought tonight. 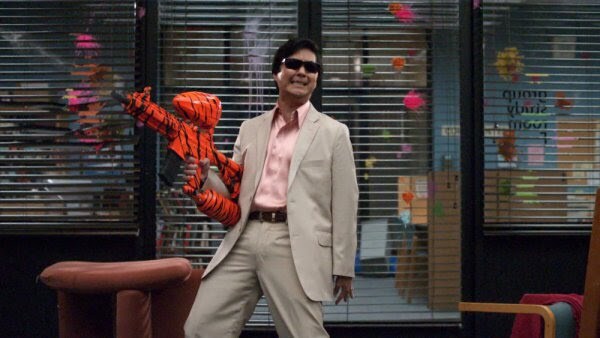 Despite those minor quibbles, "Modern Warfare" was by far the funniest episode of any show I've seen in a while. Any show that can cram in a Mexican standoff, Chow-Yun Fat, The Warriors, Die Hard, and other action flick stand-bys in 30-minutes is definitely a winner in my book. Now, let's get an episode that has a story with a little bit more meat to it.